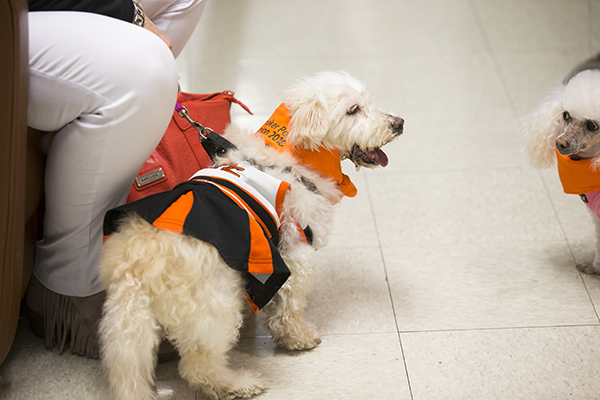 Dr. Kayse Shrum, president of Oklahoma State University Center for Health Sciences, visits with students along with her pet therapy dog, Deuce. Dr. Ryan Baumwart, veterinary cardiologist at Oklahoma State University's Veterinary Medical Hospital, created a unique group of canine survivors appropriately named the Pacemaker Posse. Over the last two years, he has placed pacemakers in 23 dogs, improving their quality of life and, in many cases, prolonging their days on the planet. In April, all the pacemaker recipients were invited back to OSU to celebrate the success of the procedure and connect with other "posse" members. "We thought this would be a great time to celebrate the success of these patients and show others a broader view of veterinary medicine," Baumwart says. Owners of five members of the Pacemaker Posse attended OSU's Center for Veterinary Health Sciences' Open House with their pets, including Maureen Cancienne, Rebecca Dees, Ken and Susie Sharp, Patricia Wayman and Mary Jo Wipperfurth. "When the veterinary center offers unique services such as this, we maintain our role as the premier specialty veterinary hospital in the state and region," says Dr. Chris Ross, interim dean of the veterinary center. "Our faculty members have a chance to showcase their skills and knowledge; animal owners have access to lifesaving treatments; and our students are exposed to cutting-edge technologies." Baumwart made a presentation to Open House guests about veterinary cardiology. Dog owners shared heart-warming stories of how a pacemaker changed their pet's life. Patricia Wayman of Goltry, Oklahoma, wanted to celebrate with her Pacemaker Posse dog, Abby, at the Open House. "About a year ago, I really noticed that Abby would be moving and then she would just go down," Wayman says. "I thought, well, she's tired." When she noticed that it was happening more and more, she says, "It just broke my heart. She would bounce back up, but I just didn't know that one of these days she wouldn't get back up. I was fortunate enough that my veterinarian, Dr. Carey Bonds (OSU '03) at Trinity Hospital, told me about Dr. Baumwart. We came over, and they ran all the tests." Dr. Baumwart diagnosed Abby with sick sinus syndrome. "The sinus node is the body's pacemaker in the heart," Baumwart explains. "When that pacemaker stops, they don't have normal blood flow to their brain, and they pass out. We have had dogs that will pass out 20 or 30 times a day." Sick sinus syndrome is one of the more common reasons dogs get pacemakers. This happens the same way in people as in dogs — older pets and elderly humans are affected with similar problems. Baumwart suggested implanting a pacemaker; Wayman had to think about it. "My family is farmers," she says. "Abby is not a farm dog; Abby's my child. So we talked about it and talked about it. Now in the small town that I live in, Abby's the bionic dog. Everybody talks about, 'Do you know that we've got a dog in Goltry that has a pacemaker?' I would do it 100 times again." Abby received her pacemaker in September 2015. She turned 11 years old in May. "She's doing extremely well," Wayman says. "Her quality of life — she's out chasing rabbits and squirrels in the backyard. I tell you, Brandy Hutchings (cardiology veterinary assistant) and Dr. Baumwart are just wonderful. I highly recommend them." Susie Sharp of Stillwater, Oklahoma, inherited her dog, GiGi, from her aunt. "I had GiGi a while, and suddenly her health was failing," Sharp recalls. "She was losing weight. She couldn't keep food down." Sharp's veterinarian did exploratory surgery to try to diagnose GiGi's problem. "My veterinarian called to say GiGi had died on the operating table twice and been brought back twice — and she's not going to come back a third time," Sharp says. GiGi did survive, and it appeared there was no brain damage. "My vet suggested that we take GiGi to an intensive care unit rapidly — either in Edmond or at OSU," Sharp says. The family chose OSU, where veterinarians determined the muscles GiGi used in swallowing were too weak to function. It was also determined that GiGi needed a pacemaker. Her first pacemaker was external, but a permanent pacemaker was later implanted internally by a former cardiologist at OSU. "I didn't know they did that," Sharp says. "We still had to deal with her esophagus issue. She was a 6-pound dog literally starving to death. During one of her checkups, I asked if a feeding tube could be placed in a dog, and they said yes." GiGi's first feeding tube wrapped around her body. Sharp started dressing GiGi in clothes to help hold the tube in place. "GiGi has a little port feeding tube now. She could go without her dress, but she's used to wearing clothes and very uncomfortable without them," Sharp says. GiGi was originally diagnosed with a third-degree blockage. She recently had her pacemaker replaced because its battery life was nearly depleted. "Blockages like GiGi's are another common condition that we treat with pacemakers," Baumwart explains. "Most animals' lives change dramatically for the better." Sharp says her family is very thankful they live in Stillwater, and "we are very grateful to OSU." Traditionally, human pacemakers — about the size of a silver dollar — are used in dogs. The biggest concern with pacemaker surgeries is the cost of the surgery. "We recently started using a company that provides animal pacemakers at a much reduced cost compared to the human pacemakers," Baumwart says. "However, this can still be a large amount of money for the average pet owner." Training in specialties such as cardiology takes years of work and study. "Our students can graduate with an awareness of the presence and possibilities in cutting-edge treatments at the veterinary center," Ross says. "Some may also decide that they would like to pursue a career in specialties like cardiology."